There are 2 main things to keep in mind when making sausage, and they are doubly important when you are preparing your sausage meat. Wash and disinfect all your knives, containers and cutting boards. Watch carefully for cross contamination possibilities and eliminate them. Wash your hands well and often with soap and water. Start with well chilled meat. 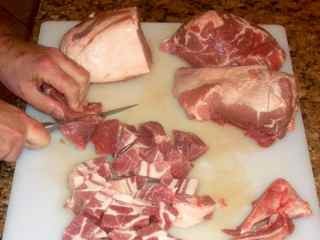 If the fat in your meat starts to "smear", it is getting too warm. Stop and re-refrigerate things until they cool down (you can also use ice and a cooler). Keeping everything as clean as possible helps eliminate harmful bacteria that could lead to the contamination of your meat. Keeping things as cool as possible helps retard the growth of any remaining bacteria (and there are always SOME bacteria). Here you can see 2 pork shoulder roasts that I have boned and halved. You'll notice I used a boning knife and worked on a high density polyethylene cutting board. I really like this kind of cutting board because it won't damage my knives and it is very easy to clean (I put it in the dishwasher, something you can't do with wood). These shoulder roasts were still partially frozen when I started boning them. You can see they continued to thaw as I worked. You don't have to be too concerned with how pretty your boned meat looks when you are done. You're going to break it down some more in the rest of the sausage making steps. 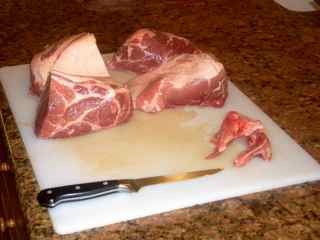 The next step in making sausage, once you have your meat boned, is to cut it into fairly even cubes. I make mine about 2 inches, but it really depends on what size works best for your grinder. This is also the time to trim away any large pieces of connective tissue that may clog your grinder plate. You should already have a pretty good idea of how much meat you have, but now is the time to weigh it again. Remember, you have boned and trimmed, so you won't have a totally accurate weight to use in calculating your sausage spices and/or cure. 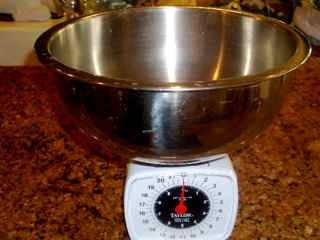 You can see how I have set the tare feature on my scale to compensate for the weight of the bowl. As you can see, preparing the meat for making sausage is pretty straight forward. Remember to keep things cool and clean and get an accurate weight measurement for the next step in the process.